I recently ran across this quote. “Every calling is great when greatly pursued.” by Oliver Wendell Holmes, Sr. When I read it, I thought of the wonderful character Bert in the movie Mary Poppins. 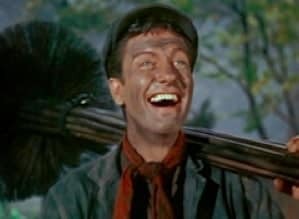 He swept streets, but he did it with such joy that, as a child, I honestly felt I wanted to be a street sweeper when I grew up. Just remember to try to find the calling that will be great FOR YOU. Find the career that you love as much as Bert loved his and your life will magically turn around, even without the help of that wonderful woman, Mary Poppins.